Verso has a dense amount of information regarding visitor rules, and then a chart of the “Telegraphic Cipher and Key”, which is a list of code words to be used in communication with other Lodges, mainly to communicate about a visiting member, to inquire after or to report on his state or situation, a;; printed in red ink. 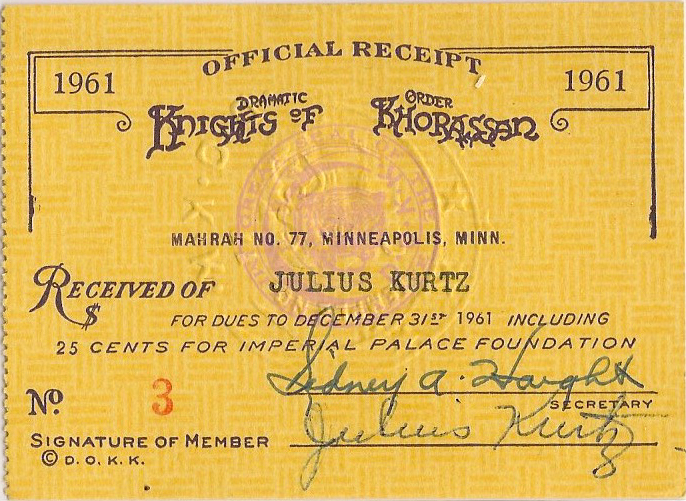 Dramatic Order Knights of Khorassan dues receipt. Local: Mahrah No. 77, Minneapolis, Minn.
Notes: Amount paid is left blank. Notes: Very delicate dues receipt. Made out to the member by name, but has no member number listed. Rather, each of which are nearly identical. 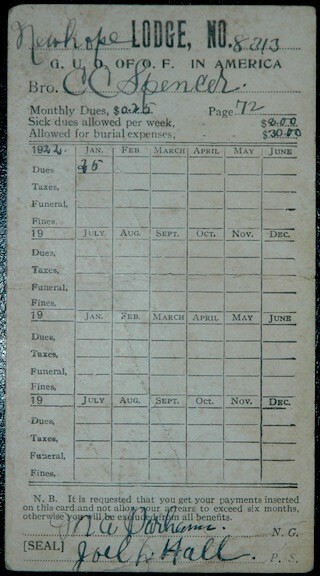 Dues are noted by hand, lower left, and an additional fee (A-B-C-D). Mr Holt paid twice a year, originally $8 per quarter including ABCD fee, later $10 per quarter. Left margin of the slip is printed with vertical stripes, sequenced as “One Year” “Three Quarters” “Two Quarters” and “One Quarter” which could be cut down to show the period paid for. 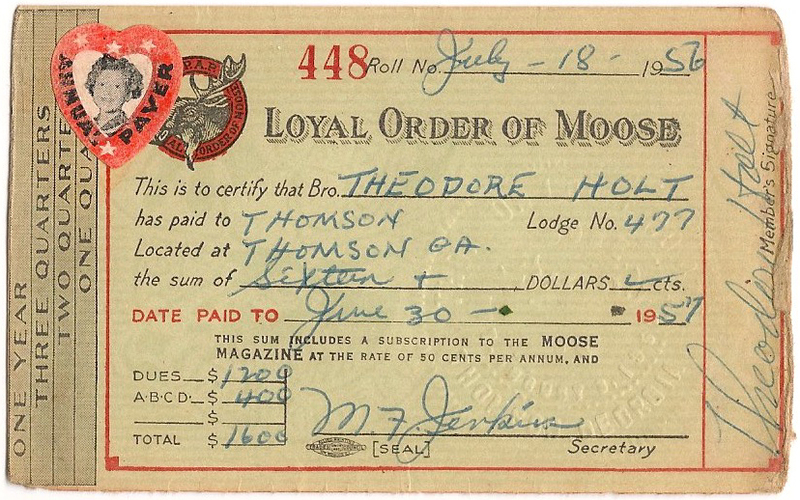 The system seems not have been used, however, and the date through which dues were paid by the member is clearly marked, centrally on the card. 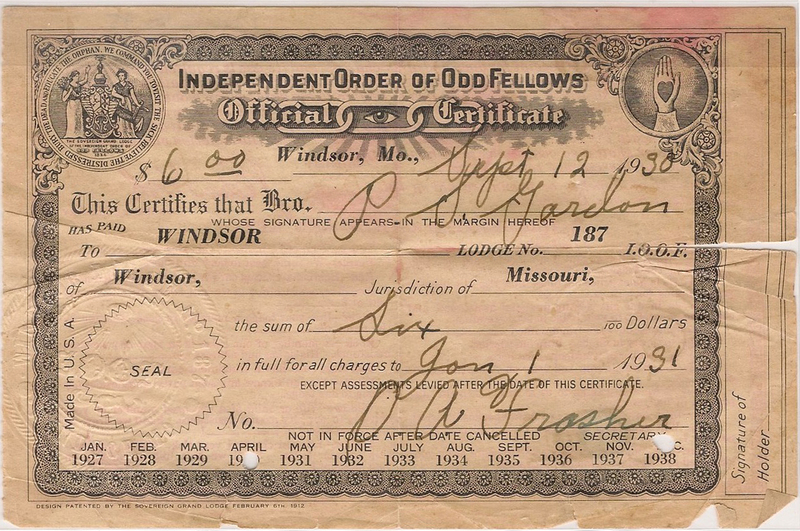 Grand United Order of Odd Fellows in America (GUOOF) dues card. 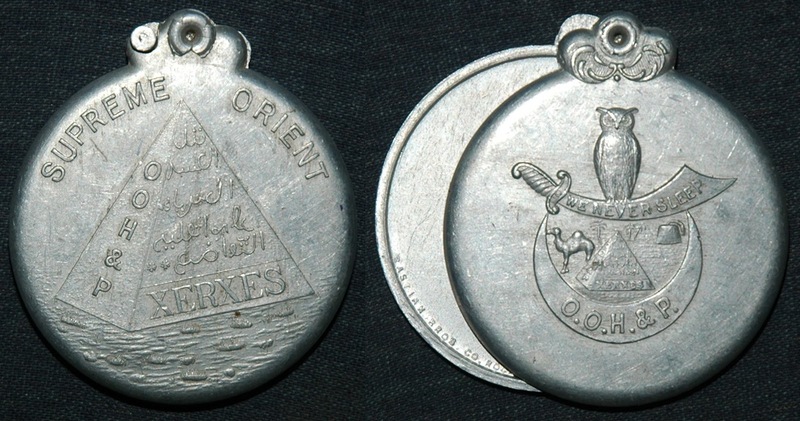 Oriental Order of Humility and Perfection (OOH&P) locket-like dues card holder. Cast aluminum (probably), with raised decoration on each side, hinged at top so as to rotate flat. One side shows the OOH&P pyramid, with “OOH&P down the foreshortened plane, and a mass of Arabic or Farsi text and the name “XERXES” on the facing plane. Over the top reads “SUPREME ORIENT”. Below the pyramid is some generic landscape texture, perhaps or rocks or earth and tufts of grass. Opposite side has the OOH&P emblem consisting of an owl sitting atop a scimitar with the legend “WE NEVER SLEEP”. From guard to point of the scimitar extends below an upward-facing crescent moon with “OOH&P” on it. Between the scimitar and moon is a sort of scene or emblem consisting of a camel, facing dexter, the OOHP pyramid as described above with palm trees in the distance, and a fez. Interior, running along the inside lower rim is the name of the maker. 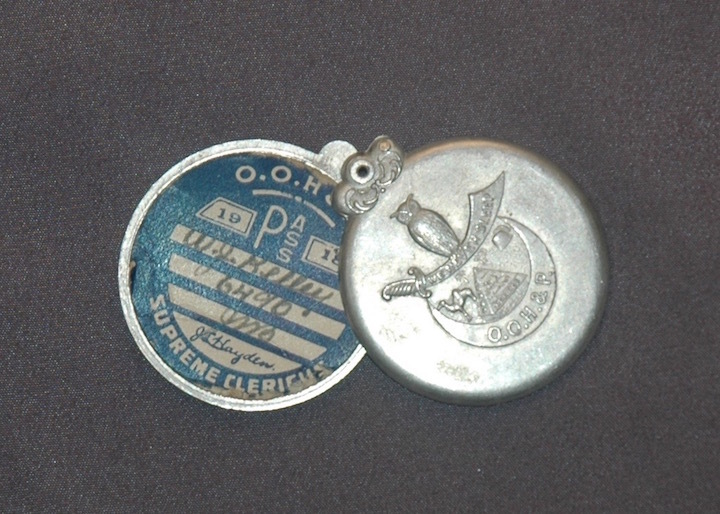 Oriental Order of Humility and Perfection membership locket with dues card inside. One side shows the OOH&P pyramid, with “OOH&P down the foreshortened plane, and a mass of Arabic or Farsi text and the name “XERXES” on the facing plane. Over the top reads “SUPREME ORIENT”. Below the pyramid is some generic landscape texture, perhaps or rocks or earth and tufts of grass. Opposite side has the OOH&P emblem consisting of an owl sitting atop a scimitar with the legend “WE NEVER SLEEP”. From guard to point of the scimitar extends below an upward-facing crescent moon with “OOH&P” on it. Between the scimitar and moon is a sort of scene or emblem consisting of a camel, facing dexter, the OOHP pyramid as described above with palm trees in the distance, and a fez. Printed into the final space is “J.L. Hayden” with “SUPREME CLERICUS” printed below in the bottom margin. Verso of card is plain white. Heavy card with offset lithograph image. 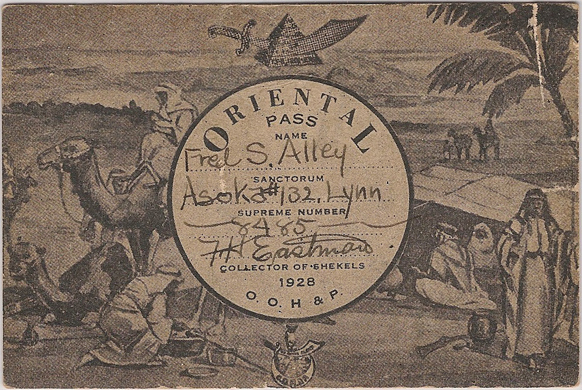 Oriental Order of Humility & Perfection dues card. A circle in the center, surrounded by a scene of bedouins in a camp, in a landscape. Dexter, a man in a thobe (robe) and kufeya headdress, riding a camel. Sinister, several figures similarly dressed, seated below a tent or other cloth cover, below a palm tree.. Above the circle is a pyramid with a scimitar piercing it. Below is the OOH&P emblem with crescent, pyramid, scimitar, and owl. The circular central portion with the inscribed information is reminiscent of the older OOH&P circular dues cards and aluminum locket holders.